Usually during the 1-4 weeks leading to the wedding day, many brides will experience both excitement and stress. Emotions come into play pushing your mind into either or both directions of positive thoughts and negative thoughts which often impact greatly in your decision making. As time is ticking and there are many preparations yet to be completed before the wedding, urgency factor further pushes your mind into the negative zone. In fact, many brides have told us that they felt like a zombie and they thought they had gone crazy. 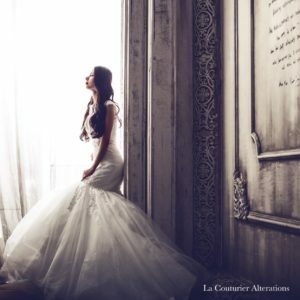 Without taking on a psychologist’s or a motivational speaker’s role, we are always happy and willing to help brides who are facing adverse difficulties. Having said that, we unfortunately still have to turn down or terminate jobs in some extreme situations such as time is insufficient based on our professional experience; the job is too complicated to work with and the risk of damaging it is too high; and the bride has become overly emotional and is able to work with. Focus on the bigger picture and not minor details. An example is to focus on how your wedding dress fit the overall look and theme of your wedding, rather than focus on how your slight weight gain or lost may have pulled your dress slightly out of shape. Perfection is the aim and not the goal. Science has proven that people who are obsessed with perfection are often stressed, easier to get physical and mental illness and have shorter life expectancy. While we all have fantasised a perfect wedding since childhood and we should aim for such wedding without getting overly too obsessed about it. We all know perfect scenarios sometimes do not happen in reality and we surely do not want to add more stress into a possible stressful situation. Plan, prepare and execute your wedding as you wish and intend, rather than how your family, friends or bridesmaids want it to be. Remember it is your wedding and you are the main character in this beautiful story. We wish all brides to have an exciting wedding and a happy marriage. Smile Brings Life. Stress Kills You.